The recent earthquake in central Italy that devastated the town of Amatrice got us thinking about other earthquakes in general and visualizing where else they've occurred recently. 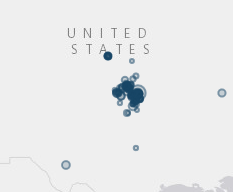 The US Geological Survey has among its great data sets an exportable list of recent earthquakes at https://earthquake.usgs.gov/earthquakes/. Handily, one of the formats they provide is a CSV, the perfect input for Geosheets, so we exported worldwide earthquake info for the 30 days leading up to September 30, 2016. All we needed to do then was import the data into Google Sheets and use the mapping functions provided by Geosheets. After importing the data into Google Sheets, we simply created a new "latlng" column for Geosheets that merged the separate latitude and longitude columns from the raw USGS data. We then added a "type" column and pasted "circle" into every cell to indicate that each location feature should be rendered as a circle, the most appropriate way to visualize these events. 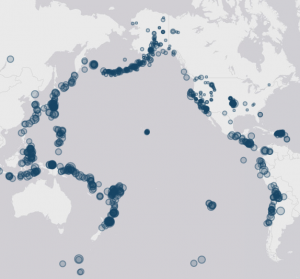 Lastly, we took advantage of the GEO_ASSIGN_RADIUS function in Geosheets, and with a single function call assigned a radius to each earthquake row that corresponds with its magnitude. Specifically, we used the formula =GEO_ASSIGN_RADIUS(H4:H1440, 0, 10) to assign a radius from each value in column H, where the magnitudes were represented in our sheet. The optional arguments 0 and 10 indicate the minimum and maximum values to use for calculating the radius. Then we simply called GEO_MAP on our data table, and presto, we have our earthquake map. 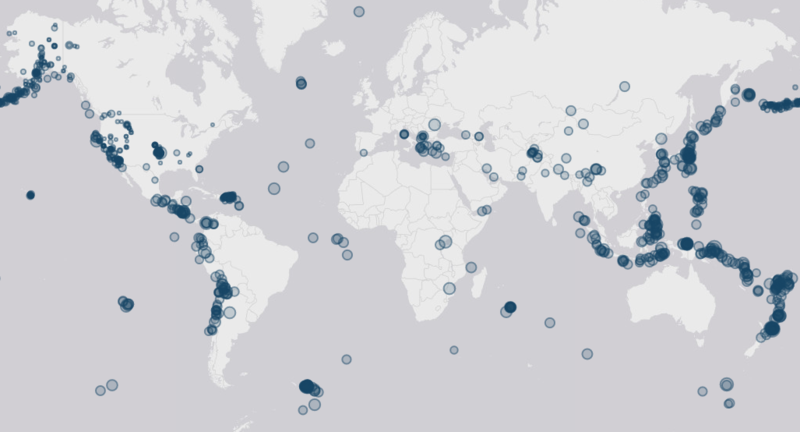 The Pacific Ring of Fire unsurprisingly shows up as the most prominent area of activity. But a few less intuitive areas of activity jump out as well, such as Oklahoma's unusual "swarm" of earthquakes which began in 2009 and is likely to be tied to wastewater disposal from oil production. 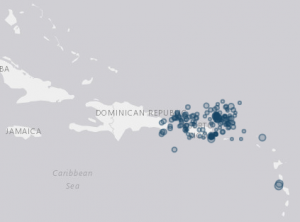 Also, previously unknown to this author is that the Caribbean shows significant seismic activity due to the Caribbean Plate. You can find our source spreadsheet for this map here and create your own: https://docs.google.com/spreadsheets/d/1Pxj7otKG8udOGz5gfUKStBfXYEbUx-CJfzhMid9jAV8/edit.